APC Smart-UPS 2200VA LCD 230V SMT2200I. APC award-winning Smart-UPS is the most popular UPS in the world for servers, storage and networks. Trust to protect critical data and equipment from power problems by supplying clean and reliable network-grade power. In addition to legendary reliability and manageability, Smart-UPS have extremely high efficiency at low, medium and high load levels making them ideal for today's multi-core or virtualized servers that have varying load consumption. Smart-UPS series have long been considered the benchmark for all network and server UPS's. Smart-UPS feature a 16-segment LED display, extended range automatic voltage regulation (AVR), and pure sine wave output on battery. Output Power Capacity 1980 Watts / 2200 VA Max Configurable Power 1980 Watts / 2200 VA Nominal Output Voltage 230V Output Voltage Note Configurable for 220 : 230 or 240 nominal output voltage Output Voltage Distortion Less than 5% at full load Output Frequency (sync to mains) 57 - 63 Hz for 60 Hz nominal Waveform Type Sine wave Output Connections (8) IEC 320 C13 (2) IEC Jumpers (1) IEC 320 C19. Nominal Input Voltage 230V Input Frequency 50/60 Hz +/- 3 Hz (auto sensing) Input Connections IEC-320 C20 Cord Length 1.83 meters Input voltage range for main operations 160 - 286V Input voltage adjustable range for mains operation 151 - 302V. Battery Type Maintenance-free sealed Lead-Acid battery with suspended electrolyte : leakproof Typical recharge time 3 hour(s) Replacement Battery RBC55. RBC Quantity 1 Communications & Management. Interface Port(s) DB-9 RS-232, SmartSlot, USB Available SmartSlot Interface Quantity 1 Control panel Multi-function LCD status and control console Audible Alarm Alarm when on battery : distinctive low battery alarm : overload continuous tone alarm Emergency Power Off (EPO) YES Surge Protection and Filtering. Maximum Height 435.00 mm Maximum Width 197.00 mm Maximum Depth 544.00 mm Net Weight 61.90 KG. Operating Environment 0 - 40 °C Operating Relative Humidity 0 - 95% Operating Elevation 0-3000 meters Storage Temperature -15 - 45 °C Storage Relative Humidity 0 - 95% Storage Elevation 0-15000 meters Audible noise at 1 meter from surface of unit 45.00 dBA Online Thermal Dissipation 275.00 BTU/hr. Model: SMT2200I Manufactured by: APC. The item must be return as it was sent, in new condition including all packaging and manuals. We will try our best to reply all e-mails within 24 hours. However, emails during weekends or holidays may take longer. Please allow up to 48 hours delay in receiving our response after long weekends or holidays. 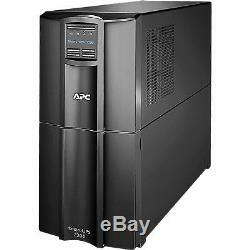 The item "APC Smart-UPS 2200VA LCD 230V SMT2200I WARRANTY NO VAT" is in sale since Monday, September 05, 2016. This item is in the category "Computers/Tablets & Networking\Power Protection, Distribution\Uninterruptible Power Supplies". The seller is "trade_clearance" and is located in Alfreton. This item can be shipped to United Kingdom.